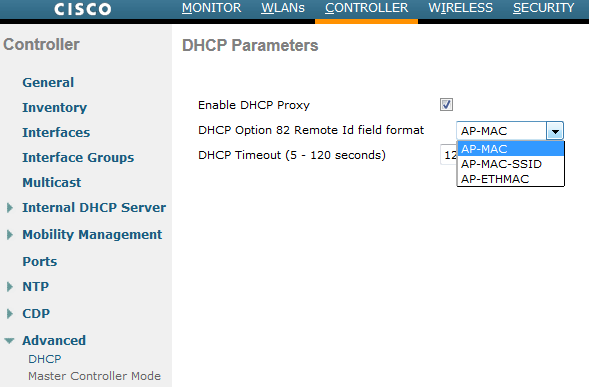 In this post we will see how DHCP option 82 works. The DHCP Information option (Option 82) is commonly used in large enterprise deployments to provide additional information on “physical attachment” of the client. 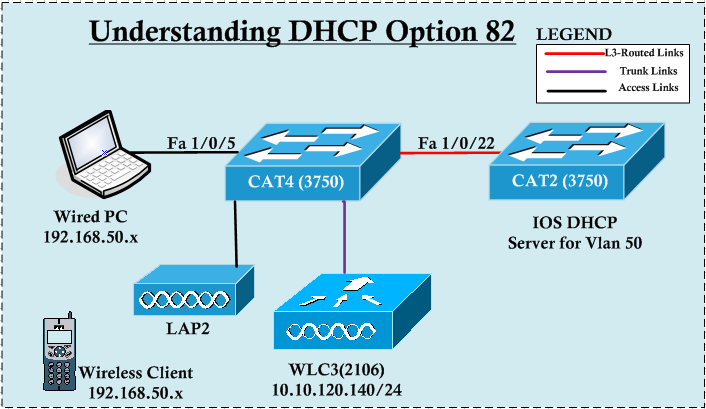 Option 82 is supposed to be used in distributed DHCP server/relay environment, where relays insert additional information to identify the client’s point of attachment. Here is the topology for this post. 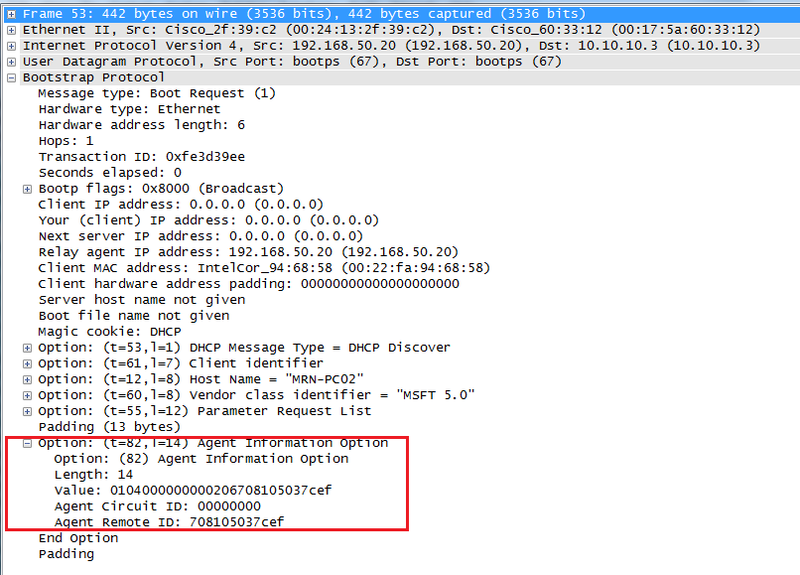 As you can see below DHCP discovery message relayed by CAT4 does not have any DHCP option 82 information elements. 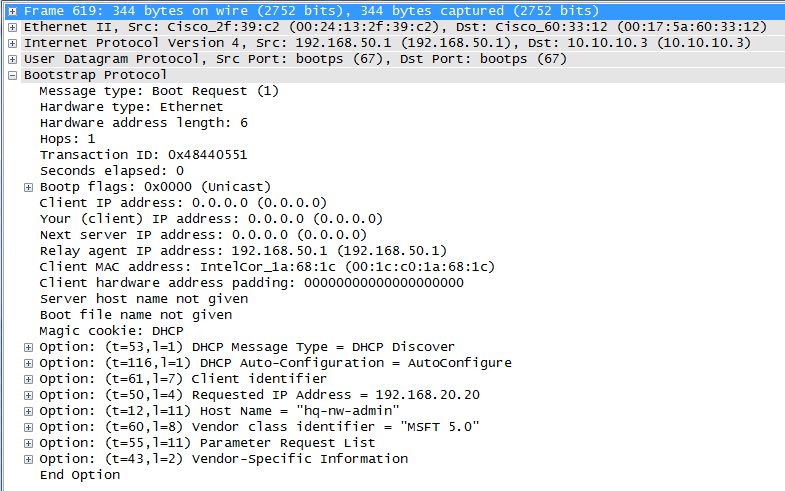 Now if you do “debug ip dhcp server packet detail” output on CAT2 you will see similar output like below. You can see the subscriber information you configured (ie MRN-DHCP82 in string or 4d524e2d444843503832 in hex) included in DHCP discovery message. *Mar 12 13:24:14.294: DHCPD: DHCPDISCOVER received from client 0100.1cc0.1a68.1c on interface Vlan50. *Mar 12 13:24:14.294: DHCPD: using received relay info. *Mar 12 13:24:14.294: DHCPD: setting giaddr to 192.168.50.1. *Mar 12 13:24:14.294: DHCPD: adding relay information option. *Mar 12 13:24:14.294: DHCPD: BOOTREQUEST from 0100.1cc0.1a68.1c forwarded to 10.10.10.3. *Mar 12 13:24:14.302: DHCPD: Reload workspace interface FastEthernet1/0/23 tableid 0. DHCP option 82 message format is having <option><length> <option content>. 52 in hex is 82 in decimal which indicate it is option 82 information. Now in DHCP server you need to define a DHCP class which matches the subscriber identification to issue IP for this client. Also server should know the relay information it should expect. If these matches it will issue an IP to client. Otherwise DHCP packets will drop by the DHCP server. So here is the CAT2 configuration. If you do ” debug ip dhcp server packet detail” on CAT2 you will see something like this. *Mar 13 00:22:44.899 AEDT: DHCPD: Reload workspace interface FastEthernet1/0/4 tableid 0. *Mar 13 00:22:44.899 AEDT: DHCPD: client's VPN is . *Mar 13 00:22:44.899 AEDT: DHCPD: using received relay info. *Mar 13 00:22:44.899 AEDT: DHCPD: DHCPDISCOVER received from client 0100.1cc0.1a68.1c through relay 192.168.51.1. *Mar 13 00:24:12.839 AEDT: DHCPD: DHCPDISCOVER received from client 0100.1cc0.1a68.1c through relay 192.168.50.1. *Mar 13 00:24:12.839 AEDT: DHCPD: using received relay info. *Mar 13 00:24:12.839 AEDT: DHCPD: Sending DHCPOFFER to client 0100.1cc0.1a68.1c (192.168.50.200). *Mar 13 00:24:12.839 AEDT: DHCPD: unicasting BOOTREPLY for client 001c.c01a.681c to relay 192.168.50.1. *Mar 13 00:24:12.856 AEDT: DHCPD: Reload workspace interface FastEthernet1/0/4 tableid 0. *Mar 13 00:24:12.856 AEDT: DHCPD: client's VPN is . *Mar 13 00:24:12.856 AEDT: DHCPD: DHCPREQUEST received from client 0100.1cc0.1a68.1c. Now will see how this works in Wireless environment. As you know for a wireless client , WLC will act as DHCP-relay and pass the DHCP discover & request messages to DHCP server. We will create a WLAN with open authentication & assign it to vlan50 interface created on the controller. If you are familiar with WLC CLI command you can do this with following commands. *Mar 13 01:28:25.637 AEDT: DHCPD: Reload workspace interface FastEthernet1/0/4 tableid 0. *Mar 13 01:28:25.637 AEDT: DHCPD: client's VPN is . *Mar 13 01:28:25.637 AEDT: DHCPD: using received relay info. *Mar 13 01:28:25.637 AEDT: DHCPD: DHCPDISCOVER received from client 0104.f7e4.ea5b.66 through relay 192.168.50.20. This is the default behaviour of a WLC ( I am in 7.0.116.0 code) & you have to configure to add DHCP option 82. You can verify this by “show interface detail vlan50” command outpt as well. (WLC3) >config interface dhcp dynamic-interface vlan50 ? (WLC3) >config interface dhcp dynamic-interface vlan50 option-82 ? 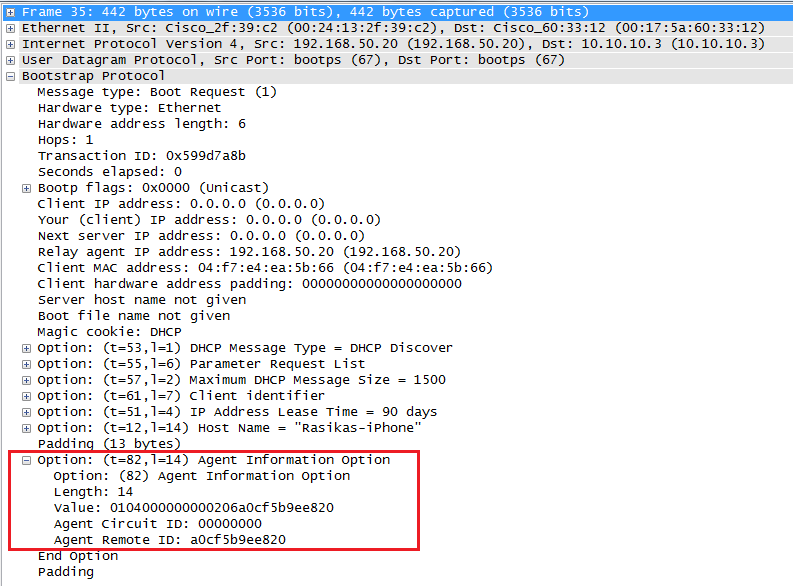 Now if you check CAT2 debug output you should see the DHCP realy information provided option 82 information as below. *Mar 13 01:37:10.682 AEDT: DHCPD: using received relay info. *Mar 13 01:37:10.682 AEDT: DHCPD: DHCPDISCOVER received from client 0104.f7e4.ea5b.66 through relay 192.168.50.20. Once you configure this you would see your wireless client get an IP from the range you specified. It should be within 192.16850.222-230 in my example. *Mar 13 01:41:44.601 AEDT: DHCPD: using received relay info. *Mar 13 01:41:44.601 AEDT: DHCPD: DHCPDISCOVER received from client 0104.f7e4.ea5b.66 through relay 192.168.50.20. *Mar 13 01:41:44.601 AEDT: DHCPD: Sending DHCPOFFER to client 0104.f7e4.ea5b.66 (192.168.50.222). *Mar 13 01:41:44.601 AEDT: DHCPD: unicasting BOOTREPLY for client 04f7.e4ea.5b66 to relay 192.168.50.20. *Mar 13 01:41:45.658 AEDT: DHCPD: Reload workspace interface FastEthernet1/0/4 tableid 0. *Mar 13 01:41:45.658 AEDT: DHCPD: client's VPN is . *Mar 13 01:41:45.658 AEDT: DHCPD: DHCPREQUEST received from client 0104.f7e4.ea5b.66. *Mar 13 01:41:45.658 AEDT: DHCPD: Sending DHCPACK to client 0104.f7e4.ea5b.66 (192.168.50.222). 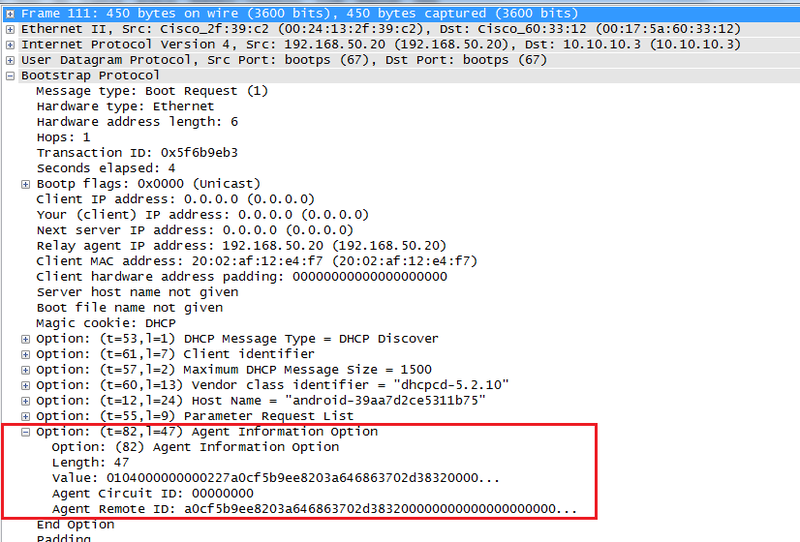 Here is the wireshark packet capture of the DCHP discovery message relayed by WLC. If you look at the DHCP option 82 information more closely you would see Agent Remote ID is AP Radio MAC address (a0cf5b9ee820). This is because by default WLC use AP Radio MAC address. 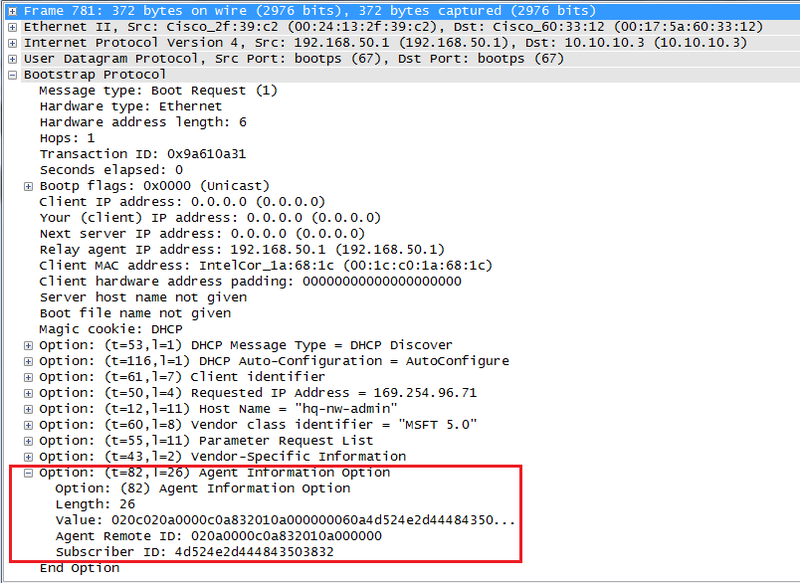 You can verify this via controller GUI (Controller -> Advanced -> DHCP) or “show dhcp opt-82” CLI command. (WLC3) >config dhcp opt-82 ? (WLC3) >config dhcp opt-82 remote-id ? As you can see other options are include AP Ethernet MAC address or AP Radio MAC & SSID. Let’s change this to AP Ethernet MAC & see the debug output. Before that will check the LAP2 MAC addresses. Once we changed Option 82 Remote-ID to AP ethernet MAC (708105037cef) address we should see option 82 information contain that instead of AP Radio MAC address. You can change it via GUI or CLI. Below show the CLI command. *Mar 13 02:40:12.687 AEDT: DHCPD: using received relay info. *Mar 13 02:40:12.687 AEDT: DHCPD: DHCPDISCOVER received from client 0100.22fa.9468.58 through relay 192.168.50.20. As you can see now relay information include AP ethernet MAC address & we have to change the relay information on DHCP server (CAT2) in order to accept these messages coming from WLC & allocate an IP address for the client. Now you can see the client get an IP & packet capture verify option 82 remote id is AP Ethernet MAC address as well. Finally we change the option-82 remote id to AP-Radio MAC address & SSID option. This time you can see the DHCP option 82 information is different to previous times. *Mar 13 03:08:30.441 AEDT: DHCPD: using received relay info. *Mar 13 03:08:30.441 AEDT: DHCPD: DHCPDISCOVER received from client 0120.02af.12e4.f7 through relay 192.168.50.20. 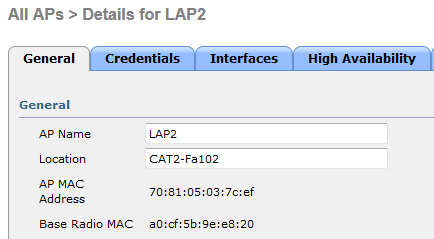 Once you add this information on to DHCP class relay information on CAT2 you would see client will get an IP. Here is the wireshark capture of this time. That’s cover the DHCP option 82. You can refer following youtube video from Jerome Henry for further information. I checked out Petr’s post about option-82 on INE and it’s nowhere near this explanation. Outstanding!! do you know what would the relay-information be if the controller was a 3850 switch? I configured an SSID on 3850 switch and configured DHCP option 82 on the SSID to use the AP’s ethernet MAC address but I don’t know what is the relay-information that I need to configure on the switch.